Tucked in the corner of the grassy courtyard, this perfectly delightful cosy self catering cottage is a treat for two (but only two! 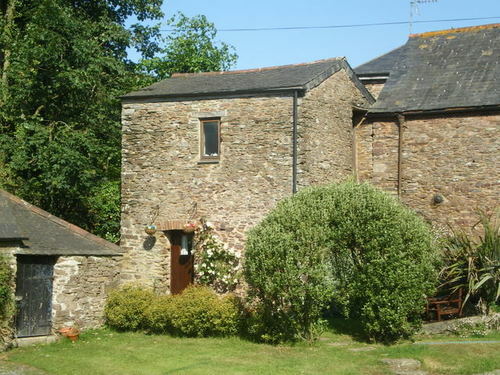 ), the perfect cottage for a holiday in Devon. It is an ideal bolt hole for an escape from the pressures of the city, an excellent base for bird watchers and walkers, or indeed a cosy nest for the romantically inclined! Take a virtual tour of The Old Granary. The cottage is attached to an old barn on one side and provides upside down accommodation with the living area upstairs. The cottage has old maple flooring with rugs, under floor central heating, and is stylishly furnished and decorated in rustic natural colours which complement the old walls. The Old Granary is an excellent example of the way a comfortable living area can be created in a relatively small space , and was designed by James and Rosie’s daughter Alice. The transition from old earth floored barn into a quality farm holiday cottage has featured in Homebuilding and Renovating Magazine and in Build It Magazine as a classic example of what can be achieved. To the right of the front door is a sunny grassed patio with wooden table and bench for al fresco eating and drinking, surrounded by flowering shrubs and plants. As you enter The Old Granary, you come into the bedroom, with the bed directly ahead covered with pillows in gold, green and rustic red. There is a hand built pine wardrobe. The bathroom is a stylish wet room with beautiful marble and a mosaic border. Tucked under the stairs is a wall hung toilet, and in the corner a contemporary basin. The curved wall gives a modern feel to the room, and is an interesting design feature. Up the curved handcrafted staircase there is a little “peep hole” which looks out onto the courtyard. On the first floor there is a well equipped kitchen with electric oven, gas hob, washer/drier and fridge with ice box, and an intimate dining area. There is a cosy sofa for two and a small TV/DVD. The walls are partially exposed leaving the beautiful old stonework to be seen in all its glory. The limed panelled ceiling with exposed beams gives the room the feel of a romantic log cabin. It is full of character. Due to space restrictions dogs are not allowed, and we must emphasise once more that The Old Granary is only suitable for two adults. It is available for short breaks (Mon-Fri and Fri-Mon), and from time to time at specially discounted rates through Sykes Cottages. A delightful and charming place to stay, and in a lovely location. We loved it, thank you, and will definitely return! Lower Collaton Farm is a quiet and absolutely charming place. The Old Granary is a tiny, cosy gem! We enjoyed our stay!! Lovely accommodation and in a great position to explore coastal and inland sites. A welcome break in a delightful setting. Have enjoyed a nostalgic visit and discovered new areas to explore. The Old Granary is a wonderful conversion which retains its character. Lovely setting, really peaceful. Thanks again! The cottage is great- compact bijou and perfect for what we wanted, a base from which to tour the area. We have really enjoyed our week in this lovely cottage. Perfect location for visiting NT properties, beautiful villages and walking stunning coastal paths. Really enjoyed our stay here. Lovely cottage, lovely weather, lovely hosts! Returned for the peace and beauty of The Old Granary. Lovely stay, most enjoyable. Cosy and snug. We enjoyed all the wildlife and the chickens! Came to write, but didn’t write a word. Too much to see and do. Wonderful little home, because it felt like that. Heavenly…. Lovely restoration, and a wonderful place. The break was just what we needed. Thank you for beautiful cottage- immaculate well equipped and very homely. It felt like home and the location was perfect. Really enjoyed our short break, lovely cottage in lovely part of Devon. Beautiful setting + fantastic location. Lovely few days in an idyllic setting. Cottage is charming and we loved the light from all the windows and the views. A total break! Lovely place, fab restoration - we love it and will def. reccomend it! Thank you. A lovely week here- very cosy!! A wonderful base for exploring South Devon. A quart in a pint pot! A tranquil base from which to explore the delights of the South Hams. Great weather too! Lovely accommodation in glorious setting. Wonderful weather, a perfect place for a holiday.! We had a lovely week away from the city. Loved the peace and quiet and also the friendly animals! The cottage is just the right size to spend time with the person that you love! What a little gem. Has suited our requirements beautifully. Will come again to make more of our stay. Warmth a plus plus!